Oakton, Virginia (CNN) In 2008, Matt Zeller was serving in Afghanistan as a captain in the US Army. One day while out on a routine mission, he and his squad were attacked by Taliban insurgents. 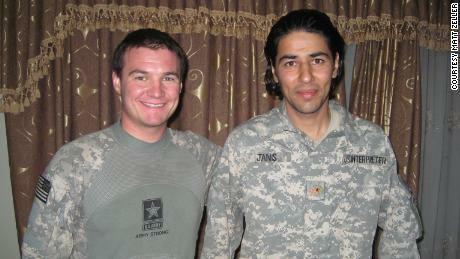 Zeller would have been killed, he said, had it not been for his Afghan interpreter, Janis Shinwari. 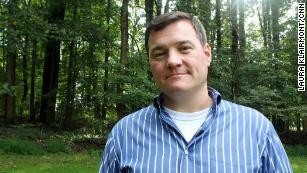 “He shot and killed two Taliban fighters who were about to kill me,” Zeller said. “That day we became brothers,” Zeller said. After that, the Taliban placed Shinwari at the top of their hit list. Before Zeller returned home, he promised he would do everything he could to bring Shinwari and his family to safety in the US. It took Zeller more than four years to help them get their Special Immigrant Visas. 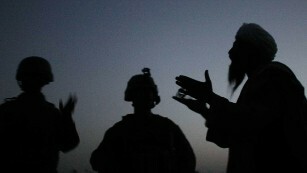 The interpreter and the soldier realized thousands like Shinwari remained vulnerable in Iraq and Afghanistan. In 2013, they co-founded the nonprofit No One Left Behind to help other interpreters who’ve put their lives at risk to work with US troops. The group has since helped more than 5,000 translators and their families come to the US, guiding them through the visa process. The organization also provides resettlement and support services upon their arrival, such as finding permanent housing, home furnishings, job placement and language skills. CNN’s Laura Klairmont spoke with Zeller about his work. Below is an edited version of their conversation. CNN: In what ways are Afghan and Iraqi interpreters essential to our troops? Matt Zeller: These individuals fight shoulder-to-shoulder with our troops. My interpreter was more vital to the survival of my soldiers than our weapons. I could always shoot back and use violence, but that was always the option of last resort. An interpreter was the individual that ultimately prevented that escalation of violence. They were the individual that could diffuse a tense and confusing situation. Janis was a cultural bridge. He was my voice to the Afghan people and their voice back to me. CNN: What sacrifices do these translators make? Zeller: They’re proud patriots who signed up to defend their country and to help us with our military’s mission over there. In so doing they put themselves and their families at extreme risks. The Taliban used to send us the body parts of interpreters that they would capture and ultimately kill as warning messages to our translators that this is what would happen to them if they continue to serve with us. Janis was hunted. Taliban assigned a hit team to go after him and his family. There were bounties placed on their heads. When my tour was ending, I had to say goodbye to Janis, and I remember it was the hardest goodbye of my life. I remember thinking I might never see my guardian angel again. How would I be able to repay him if I’m on the other side of the world and he’s suddenly very much still in danger? I remember feeling a profound sense of guilt and angst that I would not be able to protect him anymore. Because this is the thing about translators: I was going home to my family. He was going on to the next unit and the next mission. And he did that over and over and over again for nine years. CNN: What’s the process they go through for Special Immigration Visa approval? Zeller: There’s a tremendous amount of red tape that interpreters can get caught in during the visa process. The average length of processing is anywhere from four to five years. They have to prove also that they’re in duress because of those years of service. And then they have to pass the most comprehensive national security background investigation. When members of the government talk about merit-based immigration, I can think of no greater merit than saving the lives of American soldiers in time of war. CNN: What inspired you to start this organization? Zeller: When Janis came here, it was up to me to find him a place to live, to help him get a job and his children enrolled in school and his wife into English classes. And I suddenly felt very overwhelmed. With the generosity of friends and family and complete strangers who had seen the coverage of our reunion on the news, we raised over $35,000. But Janis said, “Brother, I can’t take the money.” He started naming all the translators who served on our outpost back in Afghanistan. “Don’t they deserve to be here too?” he said. “Do you think we could use the money to start an organization to do for them what you’ve done for me?” Well, that was the birth of No One Left Behind. It started because he insisted that we pay it forward. When we were guests in their country, they did such a profound and amazing job taking care of us that the least we could do is show them the same courtesy. We owe these people a great debt of gratitude. We also owe them a chance at a new and better life. We want them to feel as if they’re part of the greater community of veterans who are going to step up and take care of them. How is it that just anyone can write a blog and get as popular as this? Its not like youve said something extremely impressive more like youve painted a quite picture above an issue that you know nothing about! I dont want to sound mean, here. But do you actually think that you can get away with adding some quite pictures and not truly say something? Have you ever considered having a website online? Many people have thought of it and then taken the large step to create one. Youll do that too. In the development you do, it could be very important believe having the right kind host to your site. You are going to also need person who has the type of device that you just want to utilize. Internet sites can be for private use as neatly ones the place you wish to make money. Folks in addition to businesses have websites. The decisions are nearly endless. That is the good looks of the internet. Its conceivable youll wish to believe the usage of mambo webhosting, drupal webhosting, joomla web hosting, or WordPress internet hosting on your website. Those are excellent puts to begin your research. – Lawn Mowers For Sale : Best Buy Lawn Mowers For Sale Cheap & Discount Price! It will always be interesting to read content from other authors and use something from their web sites. Can I simply say what a relief to discover somebody who really understands what they are discussing on the web. certainly like your website but you have to check the spelling on several of your posts. Several of them are rife with spelling issues and I in finding it very bothersome to inform the reality on the other hand I will surely come again again. I blog frequently and I really thank you for your information. This article has truly peaked my interest. I will take a note of your blog and keep checking for new details about once a week. I opted in for your Feed as well. Hi colleagues, its wonderful piece of writing regarding teachingand fully defined, keep it up all the time. Hey there! Someone in my Facebook group shared this website with us so I came to take a look. I’m definitely loving the information. I’m bookmarking and will be tweeting this to my followers! Terrific blog and outstanding style and design. Aw, this was a really good post. Taking a few minutes and actual effort to produce a good article… but what can I say… I procrastinate a lot and don’t manage to get nearly anything done. Spot on with this write-up, I actually feel this amazing site needs a great deal more attention. I’ll probably be back again to read more, thanks for the info! Great internet site! It looks extremely expert! Sustain the excellent work!EXPERTUTLATANDEManga handcuff lider av otillracklig penisstorlek. Det kan finnas olika orsaker, inklusive alder, ofta weight, ohalsosam eller otillracklig naring, brist pa vila, brist pa hormoner, alkohol och nikotin missbruk och annat desde donde se mide el pene. Alla leder plow samma resultat: nedgang i kvaliteten pa sexlivet.Below de senaste 20 aren har desde donde se mide el pene binge sett the human race i alla aldrar och livsstilar med detta problem. Vi lyckades hitta det perfekta botemedlet looking for att hjalpa dem. Namligen Titan Gel! Under the aegis kliniska provningar har det visat sig vara effektivt aven i de svaraste situationerna.Jag kan verkligen rekommendera Titan Gel come.allformens.nl/prostatit/desde-donde-se-mide-el-pene.php desde donde se mide el pene cash-box alla mina patienter som den basta losningen. De som redan har provat det uppskattar det mycket! XeoN6y Thanks for sharing, this is a fantastic blog post.Really thank you! Much obliged. I’ve been exploring for a bit for any high quality articles or blog posts in this kind of house . Exploring in Yahoo I eventually stumbled upon this web site. Studying this info So i am happy to convey that I have a very good uncanny feeling I discovered just what I needed. I so much no doubt will make certain to do not fail to remember this site and give it a look on a constant basis. I’ll immediately take hold of your rss as I can not in finding your email subscription hyperlink or newsletter service. Do you’ve any? Please allow me realize in order that I may subscribe. Thanks. xNUDKJ Thank you for your blog post.Really thank you! Want more. I do agree with all of the ideas you’ve presented in your post. They are very convincing and will definitely work. Still, the posts are very short for starters. Could you please extend them a little from next time? Thanks for the post.